This is definitely one of the most popular fast car beds type. Stylish shape and bright colors will make it a perfect addition for a boy’s room, creating a one of a kind environment — especially, if you choose stylish matching furniture to make the picture complete. This is another idea that is also quite popular and, thus, easily available in stores. You can choose practically any ‘brand’ and color — the choice is incredibly impressive, and the atmosphere in the room might prove to be even more stylish than with racing car. Vintage car designs are also quite popular. Sure, such models will look a bit more space consuming than racing or sports car models, but the end result is totally worth it. Vintage cars look sweet and impressive at the same time. This is undeniably one of the most ultra-modern approaches to boy’s room decoration. Apart from the headlights, some car bed models will also have a decorative LED lighting stripe in the body of the ‘car’. Another great perk of going with LEDs, is that it is possible to find practically any LED color your like — some of such cars might even change lighting shades. The widest range of different buses, trucks, and vans are also available in stores. Once again, such beds occupy a bit more space, so they are not the best suggestions for small rooms. In big ones, though, they will look more than impressive. This is another impressive idea for a little boy’s room. 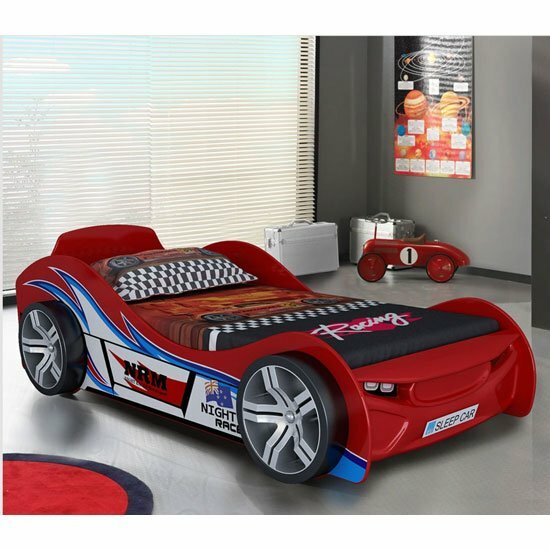 Compact police car or bright red fire engine will look gorgeous and you can stay absolutely confident that any boy will love a bed like this. Whichever model you choose, do not forget that quite often general furniture stores will offer you more reasonable pricing policy than platforms that sell children’s furniture exclusively. Furniture in Fashion , for example, is one of the best UK stores that have very impressive selection of furniture at affordable prices. Even though this is not a children’s furniture platform, the choice of units for kids’ rooms is worth checking out. By the way, if you live somewhere close to Farnworth, you can also make a quick trip to company showroom and take an actual look at any piece you find interesting.